After several unsuccessful years of hoping to come across the St Mark’s Greenbelt during one of my neighborhood walks, I resolved this past spring to make a dedicated effort to find it. Although I had yet to visit it, I imagined the Greenbelt would present a unique environment to enjoy Capitol Hill, and another pathway to connect the highlands of 10th Avenue with the lowlands of Lakeview Drive. Google maps revealed that the Greenbelt is between the Blaine Street hill-climb and St Mark’s Cathedral. I decided to make a bit on a loop of my search, and took the long drop down the Blaine Street hill-climb from 10th Avenue to Lakeview Boulevard, after which I planned to ascend back up to Tenth through the Greenbelt itself. Scaling our numerous hill-climbs is always enjoyable, and it was nice to actually descend the Blaine Street steps. The hill-climbs are a unique feature of Seattle, and a nice way of being in a public right of way reserved solely for pedestrians, instead of one shared with cars or even bicycles. Carving their way through the landscape, they offer a great perspective on the very edges of what is buildable, and present a distinct character from the side that is on more level ground. During my loop I happened to pass the Egan House, Historic Seattle’s youngest building. 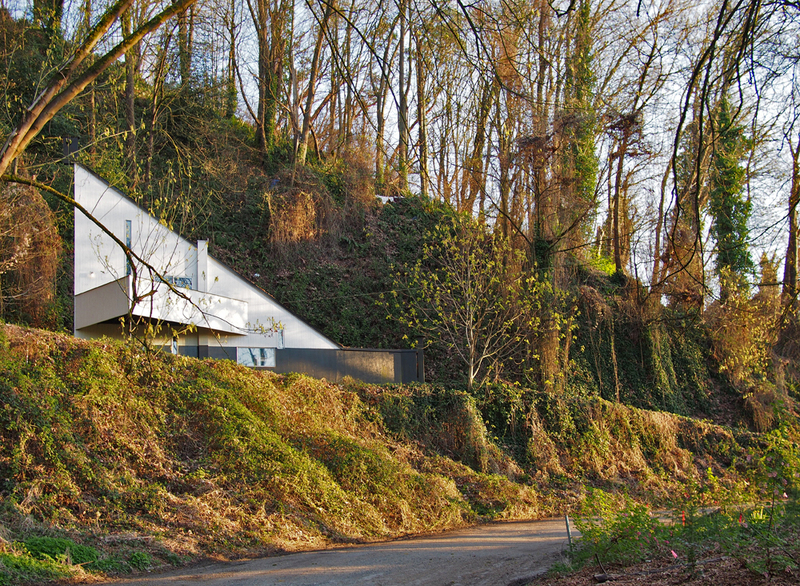 After going down the hill-climb, I had a new appreciation for the Egan House’s bold geometry, reflecting perfectly the slope of the hillside I just descended. The Lakeview trailhead to the Greenbelt is just south of the Egan House, and starts out rather steeply. The first dozen yards or so were nothing noteworthy, mostly a collection of various camping spots. It was quite another story, however, when I rounded a corner and was presented with the back of the home of one of Capitol Hill’s most illustrious former residents, Sam Hill. Mr. Hill was a railroad executive and promoter of transportation of all kinds in the late 19th and early 20th century (Wikipedia has a nice entry). In the early 20th century, Mr. Hill decided to locate his Seattle residence at the northern edge of the Harvard-Belmont neighborhood. Edge indeed, as the difference between the street side of the house and that of its hillside side must be one of the most dramatic one could encounter in the neighborhood. The drama is best captured by the arc of the driveway, with its foundation forming a formidable wall, making the driveway above appear much larger and more important than it otherwise would. This view came as quite a surprise, as for years I have admired Mr. Hill’s house, but on its Highland Drive side. Continuing my way up the Greenbelt to 10th Avenue, I was presented with an equally dramatic view of the backside of a building many of us are familiar with, St Mark’s Cathedral. Less ‘refined’ than its 10th Avenue entry, I find its backside much more satisfying. Lacking the brick veneer of the 10th Avenue entry, the back and sides of St Mark’s are unadorned concrete, the subtle textures of its board-forms adding a most pleasing texture. 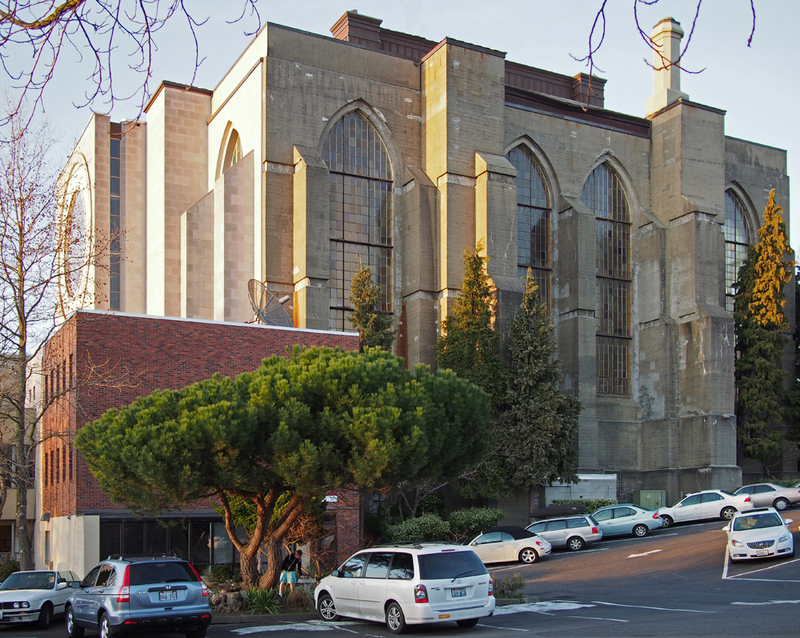 The surprise was not, however, as great as the differences between the front and back of the Hill house, as the sides of Saint Mark’s are easily visible from 10th. Surprise often results when the difference between expectations and what one actually experiences. As a means to punctuate such a difference, I returned to the Hill house, but to that side which one typically encounters along Highland. The classic proportions of the building and its fine detail are little indication of what lurks just out of view. A clever recessed bay window and sundial are but a few of the building’s refinements and are in contrast to the expansive and monolithic wall now out of view. And I suppose it was just this kind of contrast – the contrast between what is known and what it discovered – that I was looking for when I embarked on this particular walk. Fortunately for us this kind of surprise is easily found within the diversity of our neighborhood, and one that will keep me searching and surprised for years to come.